Dust control measures apply to any construction site where there is the potential for air and water pollution from dust traveling across the landscape or through the air. Dust control includes practices used to reduce or prevent the surface and air transport of dust during construction. The EPA’s recommendations are to clean and impact the least possible areas if they are not going to be worked. However, we all know that sometimes due to scheduled activities, the clearing and grubbing of the entire site is done all at once, although this might be different on large-scale projects. The most used alternative, due to its low cost of implementation and excellent results. Water should be applied at least three times a day or more, depending on the atmospheric conditions. Also, you should be aware of the quantity of water applied and prevent excess water that can cause erosion problems. 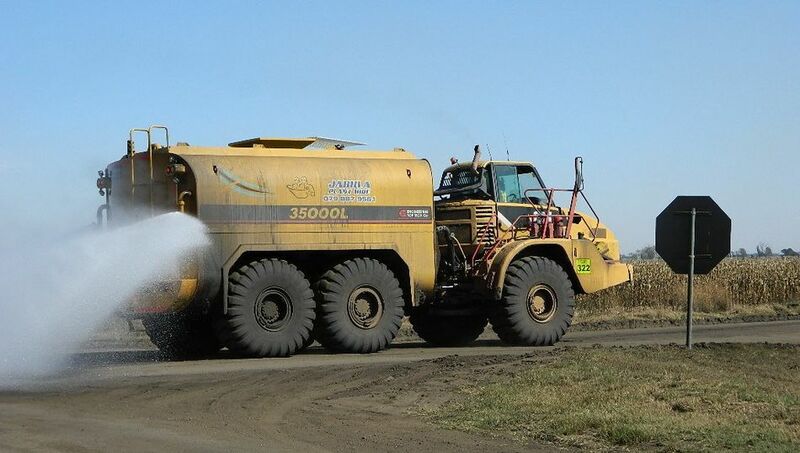 A water tanker is driven on-site spraying water over the affected areas preventing dust from airborne. May be applied to protect exposed soil from both wind and water erosion. Although this method is "green" friendly, watering your vegetation can become a headache if not coordinated properly as it might bring erosion problems as well. When applied, this technique can reduce wind erosion by up to 80 percent. Hydro-seeding is one of the dust control methods preferred by construction projects. However, one important thing, depending on where this is located, seeds can be attractive to birds and wildlife, and you could end up losing about 50% of your seeds due to the birds. A control measure performed with chisel type plows on exposed soils. Tillage shall begin on the windward side of the site. Tillage is only applicable to flat areas. Roughening the soil can reduce soil losses by approximately 80 percent in some situations. Tilling should leave 6 in. (minimum) furrows, preferably perpendicular to the prevailing wind direction, to gain the greatest reduction in wind erosion, thus maximizing dust control methods. Can be an effective practice for areas that do not receive vehicle traffic. Dry applied polymers must be initially watered for activation to be effective for dust control. This method bonds the individual soil particles together, and when it dries, it forms a flexible "crust" that strengthens the surface of the soil. It has been determined that the effectiveness of this solutions ranges from 70-90 percent. This dust control method can create a fiber-to-seed-to-soil bond (without hardening) that reduces the need for re-seeding and minimizes soil erosion. During a wetting event, the polymer material absorbs water, which allows the tackifier to go back into solution. Upon drying, there is a new seal over the soil solving the dust control problem on construction sites. Chloride retains moisture for prolonged periods helping you fighting against dust and erosion problems. The unique property of chlorides helps to hold down dust and stabilize unpaved road surfaces, creating smooth-riding roads that last. A board fence, wind fence, sediment fence or similar barrier can control air currents and blow soil. All of these fences are normally constructed of wood. Perennial grass and stands of existing trees may also serve as wind barriers. Barriers prevent erosion by obstructing the wind near the ground and preventing the soil from blowing off-site. Barriers shall be placed at right angles to prevailing wind currents at intervals of about 15 times the barrier height. Solid board fences, snow fences, burlap fences, crate walls, bales of hay and similar material can be used to control air currents and blown soil. Stone can be an effective dust deterrent for construction roads and entrances or as a mulch in areas where vegetation cannot be established. In areas of high wind, small stones are not as effective as 8-inch stones. Normally used in highways or paved roads, sweep equipment can be used to clean debris and dust from paved or roadways. I am not a huge fan of this method, as sometimes it seems that more dust is being released into the air rather than sweep or vacuum. However, it is another tool available for you.